Rich compensation in academia has long drawn skepticism, or scorn, apparent most recently in the tax legislation. A seven-figure salary to run a nonprofit college? You know what they say: Pro Humanitate. That's the motto of Wake Forest University, where President Nathan Hatch came in first in the Chronicle of Higher Education’s new ranking of compensation for heads of U.S. colleges. In 2015, the latest year for which data are available, he earned $4 million. Hatch is one of 58 college presidents with total compensation of more than $1 million, up from 39 in 2014 and 32 in 2013, according to the Chronicle’s calculations. Average total compensation for school heads serving the full year was $569,932, up 9 percent from 2014's average. The data were drawn from federal tax filings for 500 private, nonprofit schools. "It certainly raises eyebrows," said Dan Bauman, a data reporter for the Chronicle. "It's unusually high." To recruit and retain senior executives, schools often include deferred-compensation packages, a trend noticeable among most of the top earners in 2015. The chart-busting payday for Hatch, who has headed up Wake Forest since 2005, was partly from compensation of more than $3 million that came due in 2015, said Katie Neal, a spokeswoman for the university. "President Hatch's compensation over the course of his tenure reflects his exceptional leadership," trustee chair Donna Boswell said. The school has raised nearly $800 million under Hatch, she said. Total compensation includes base pay, bonus pay, nontaxable benefits (for example, health benefits, life insurance and dependent care) and other pay (such as severance payments, spending accounts and club dues). Such perks as housing and travel may also be included. Hatch had base pay of $839,944 and a bonus of $92,000. In fact, all five of the highest-paid university presidents in the report on 2015 reaped deferred pay and bonuses that dwarfed their base salaries. James Wagner, then head of Emory University, took home the second-highest amount, fueled by a 10-year deferred-compensation award, according to spokeswoman Nancy Seideman. Of Wagner's $3.51 million take-home pay, $991,460 was his base salary, according to the Chronicle. High pay and hefty endowments in academia have long drawn skepticism, or scorn, apparent most recently in the depths of the Republican-drafted tax legislation making its way through Congress. If it is passed in its current form, schools with more than $500,000 in endowment assets per student — about 30 universities, including Emory, as of 2014 — could see their annual investment income taxed at 1.4 percent, a levy that higher-education advocates have decried as "arbitrary," saying it "makes no sense." Currently, both public and private nonprofit colleges are tax- exempt. Across the country at the University of Southern California, C.L. Max Nikias collected a total of $3.18 million, of which $1.5 million came from a "one-time special bonus," said John Mork, chairman of the school's board of trustees. Since joining the school as president in 2010, Nikias has been responsible for a record-high level of freshman applications, the largest campus expansion in university history and "exceptional success" in the school's fundraising efforts, Mork said. "For these reasons and many others, the executive committee of the board believes that President Nikias is doing an excellent job and was appropriately compensated," he said. 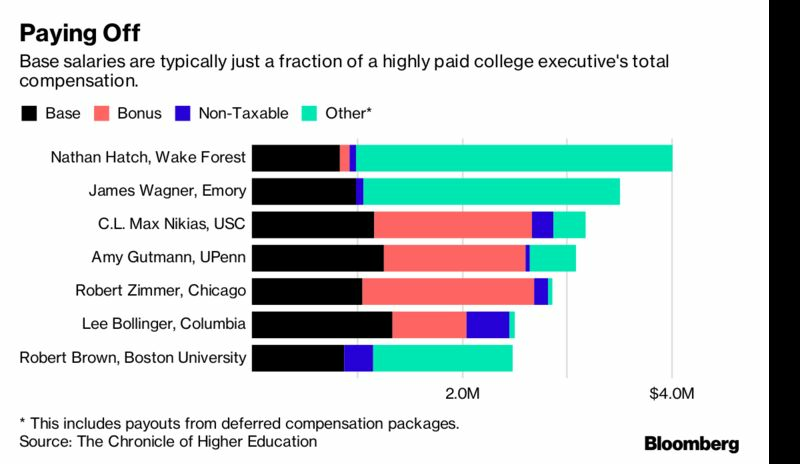 This chart shows the compensation breakdown for top earners running colleges in 2015. A modern university president’s responsibilities are greater than people may realize, the Chronicle’s Bauman said. School heads are often expected to lead the university as well as its medical enterprises, fundraising efforts, alumni relations and many other endeavors, all under the public eye, he said. "It's not the interpretation that we get from pop culture, the guy sitting behind a big wooden desk reading Plato," Bauman said. As college presidents' compensation has risen, so have tuition and student loan debt. In 2004, about $364 billion in student loans was outstanding. That figure has more than tripled to $1.3 trillion, according to the most recent New York Fed data. "You have a lot of people arguing that the pay for presidents is out of line for someone in a nonprofit education role," Bauman said.Argue away, say boards of trustees, usually the body responsible for determining a president's compensation package. Amy Gutmann, president of the University of Pennsylvania, took home $3.09 million in 2015, making her the highest-paid Ivy League head and the fourth-highest paid overall. David Cohen, chair of the school's board of trustees, said he wouldn't do anything differently. "The trustees believe she is the best university president in the country and that her salary should rightly reflect the stellar leadership she has brought to Penn," he said. To compile its list of private, nonprofit schools, the Chronicle looked for those that have the biggest endowments, are listed as participating in the Title IV federal student aid program and are classified as baccalaureate, master’s or doctoral institutions.